Fans of stand-up comedian Mike Birbiglia (Cedar Rapids) and This American Life host Ira Glass will want to check out Sleepwalk with Me when it debuts later this summer. The film, co-written and co-directed by Birbiglia, follows a struggling stand-up comic who is trying to balance a failing career, a rocky relationship and uncontrollable bouts of sleepwalking. Glass co-wrote and produced the film, based on Birbiglia’s sucessful one-man show. Sleepwalk with Me also stars Lauren Ambrose, Carol Kane, James Rebhorn and Cristin Milioti. Look for it in theaters August 24th. 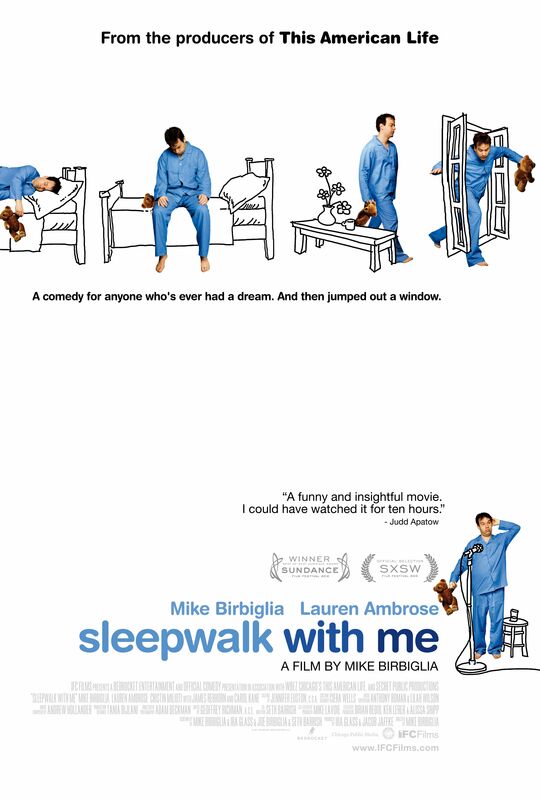 Hit the jump to check out the synopsis and new poster for Sleepwalk with Me. “I’m going to tell you a story and it’s true… I always have to tell people that,” so asserts comedian-turned-playwright-turned-filmmaker Mike Birbiglia directly to the viewer at the outset of his autobiographically inspired, fictional feature debut. Birbiglia wears his incisive wit on his sleeve while portraying a cinematic surrogate. We are thrust into the tale of a burgeoning stand-up comedian struggling with the stress of a stalled career, a stale relationship threatening to race out of his control, and the wild spurts of severe sleepwalking he is desperate to ignore. Based on the successful one-man show, SLEEPWALK WITH ME engages in the kind of passionate and personal storytelling that transfigures intimate anguish into comic art. Produced and co-written by Ira Glass (NPR’s “This American Life”), SLEEPWALK WITH ME features a stellar supporting cast that includes Lauren Ambrose (“Six Feet Under”), Carol Kane (Taxi), James Rebhorn (Meet the Parents), Cristin Milioti (“30 Rock”), and a sampling from the who’s who of today’s stand-up scene. Bursting with sincerity, Mike Birbiglia’s foray into the medium marks the invigorating emergence of a strong and poignant American voice, at once hilarious and heartbreaking.